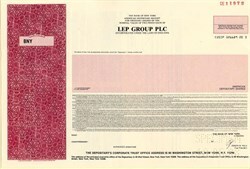 Beautiful engraved ADR specimen certificate from the LEP Group PLC . This historic document was printed by United States Banknote Corporation and has an ornate border around it. This item has the printed signatures of the Company's Vice-President. LEP Group Plc provides freight forwarding and distribution services through its network of directly held interests in over 30 countries. The group provides electronic security services in the United States and property investment in the United States and the United Kingdom. Freight forwarding and distribution services accounted for 90% of revenues; security services, 9%; property and other, 1%. The group has operations in the United Kingdom, the Americas, Europe and Asia.